TUSCALOOSA, Ala. (AP) — Two days after No. 1 Alabama’s season opener, Tua Tagovailoa was behind Jalen Hurts in the stretching line before practice as always. Hurts decided it was time turn over the team to Tagovailoa, not only as its starting quarterback but as the Crimson Tide’s leader. It’s clearly Tagovailoa’s offense now, though Hurts maintains a big role on and off the field. The sophomore left-hander from Hawaii has done the seemingly impossible, living up to the substantial hype from his star-making national championship game performance. Tagovailoa spoke to reporters Tuesday for the first time since early August. He has swiftly emerged as one of the nation’s top passers , leading in efficiency rating (238.32) and ranking second with a 75-percent completion rate. He’s also averaging 17.59 yards per completion and 13.19 yards for each attempt, both second in the FBS. Tagovailoa burst onto the national radar when the former five-star recruit led Alabama to a comeback win over Georgia in the College Football Playoff title game . His 41-yard touchdown pass to DeVonta Smith on second-and-26 has generated T-shirts, and Alabama’s marching band even formed that down and distance in its opening game halftime show. Tagovailoa won a position battle with the two-year starter Hurts and entered the season as the betting favorite for the Heisman Trophy. Offensive tackle Jedrick Wills says through all the attention, Tagovailoa “hasn’t changed at all” and handles it well. If the attention hasn’t changed him, Tagovailoa doesn’t hesitate to say why. It’s his religious faith, something he’s probably more comfortable talking about than his own play. “Most definitely not going overboard with things, staying levelheaded, knowing who I am,” he said. “I’d say most definitely with my faith, there’s no room for me with it. 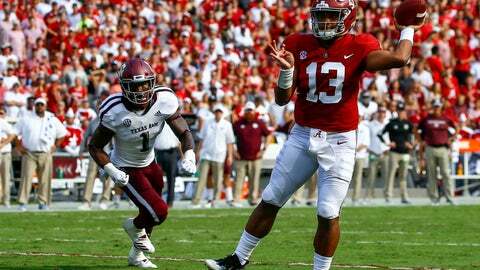 Tagovailoa received praise aplenty on the field, leading Alabama to such big leads that he has only attempted 19 second-half passes. He’s watched every fourth quarter from the sideline. Tagovailoa has thrown for eight touchdown passes in the first quarter alone and is directing the nation’s top scoring offense. He also had the program’s fifth-best passing total with 387 yards against Texas A&M , the Tide’s closest thing to a competitive game so far. Saban said Tagovailoa has probably exceeded his expectations “to some degree, in terms of his consistency.” The quarterback himself would need to hear that comment for himself. Tagovailoa displayed his ability to escape from defenders on Alabama’s opening drive of the season against Louisville, spinning away from a defender and hitting Jerry Jeudy for a touchdown. How does Tagovailoa refine moves like that? “Sometimes I drop back, and sometimes I just practice back-flipping and throwing,” Tagovailoa said, smiling. He’s much more forthcoming in praising his receivers, running backs and offensive line. And especially Hurts, who stuck around after losing the starting job and has played in every game. Tagovailoa pointed to Clemson quarterback Trevor Lawrence getting hurt in the first game after supplanted starter Kelly Bryant announced plans to transfer.